The Alabama Historical Commission created the Alabama Register of Landmarks and Heritage as a listing of historic resources (buildings, sites, structures, objects, districts, and cultural landscapes) in Alabama that are worthy of preservation. These properties may be of national, state, and local significance. The designation is honorary and carries no restrictions or financial incentives. It also does not carry automatic listing in the National Register of Historic Places. Map of Alabama Register Properties This web map represents a plot of properties and historic districts listed on the Alabama Register of Landmarks and Heritage. Locational data on this map is considered highly accurate at all map scales, unless a specific disclaimer is made in the attribute data (typically after the property name). This map is currently a work in progress; however, the map automatically updates as new details and attachments are added. For those that prefer, this data is also available as a GIS REST Service for use with ArcGIS for Desktop. Details are listed on the map’s contents page, or contact eric.sipes@ahc.alabama.gov for more information. 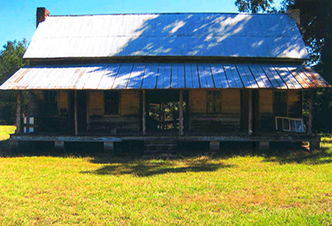 The Alabama Historical Commission assists owners with placing an order for a plaque for the property once it is listed. Owners may download, fill out, and submit the Alabama Register Plaque Application to the Commission. Complete the Alabama Register Form. Refer to the Instructions for completing the form. You may be contacted for additional information. The National Register (NR) of Historic Places is the nation's official list of cultural resources, 50 years or older, worthy of preservation. Authorized under the National Historic Preservation Act of 1966, the National Register is part of a nationwide program to coordinate and support public and private efforts to identify, evaluate, and protect our historic and archaeological places. The Alabama Historical Commission maintains files for the Alabama Register, National Register, Cemetery Register, and Architectural Survey programs. To use the AHC research files, make your appointment at least two days in advance, Monday through Friday, between 8:30am-11:30am and/or 1:00pm to 4:00pm. The AHC is closed state holidays. For more information about the Alabama Register, contact Hannah Garmon at 334-230-2644 or hannah.garmon@ahc.alabama.gov. To make research appointments contact Nicole Woods at 334-230-2673 or nicole.woods@ahc.alabama.gov.